Ibrahim Al Sheikh Issa, 16, and Mohammad Ahmad Al Natour, both sixteen, were killed early this morning in their home, Balata Refugee Camp. The boys were defending their home with rocks. According to IMEMC: "The [medical] source said that Ali was shot with a live round in his neck, and Al Natour was shot with a live round in his chest; Al Natour died before medical teams were able to transfer him to the hospital. Camp Medical teams were not spared by these pitiful excuses for soldiers that Israel calls "special elite units...against terror infrastructures." The "terror infrastructure" just happens be someone's home, someone's child, or your family physician. 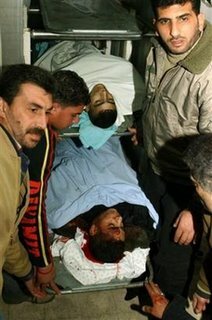 "Dr. Ghassan Hamdan, head of the Medical Relief in Nablus, reported that soldiers fired at medical teams in the camp. "One doctor was shot and injured while she and her team were trying to evacuate one of the injured residents. She was identified as Anan Al Ateera. "Dr. Hamdan added that Dr. Al Ateera was hit by bullet fragments in her head."